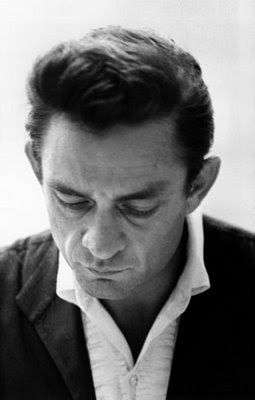 The late great and never to be forgotten Johnny Cash would have been 77 years old today. R.I.P. Johnny Cash. Here's my favourite Cash song, which one is yours? Here's a link to an npr stream called 'Inside Johnny Cash's Folsom Prison' with loads of great links where you can listen and compare Gene Beley's recording, from the audience, of Cash's 1968 performance at Folsom Prison, with the official recordings, from the album, "Johnny Cash at Folsom Prison". Enjoy these great moments of musical history. and because I couldn't resist, here's a recording of Folsom Prison Blues from 1959. Check out the gum chewing moment. Man, Johnny Cash is the man! My favorite song of his has got to be "I've Been Everywhere" but all of his songs are great. R.I.P.